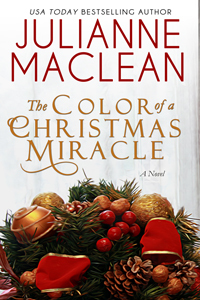 From USA Today bestselling author Julianne MacLean comes a special holiday novel in her popular Color of Heaven Series, where people are affected by real life magic and miracles that change everything they once believed about life and love. Claire Radcliffe has been blessed with a wonderful life—a loving husband, a fulfilling career, and a perfect house in a charming historic neighborhood. But with each Christmas that passes, the one thing she longs for most of all continues to elude her, and before long, her life doesn’t seem so perfect anymore. When yet another holiday season approaches and her marriage suffers the worst possible blow, Claire must learn to have faith in destiny, and allow herself to believe that miracles can happen to anyone—especially at Christmastime. Heartwarming and inspiring, The Color of a Christmas Miracle is the tale of one woman’s journey to find happiness, and to learn the power of forgiveness and redemption on the path to true love. "Wow! This is one of those "l couldn't put it down" books. The penny dropped right at the end of this amazing story as to why it is titled "The Color of Forever". Believe me when I say that this is a page turner like you have never read before." "It makes the reader think about what could have been, and loves past, and makes you wonder if you are leading the life you're meant to be leading. Thought-provoking, emotionally-intense and riveting, Ms. MacLean delivers another 5-star romance in The Color of Forever"
"There are just not enough words for me to explain how much I loved this book!"